The University of Alabama’s Center for Community-Based Partnerships (CCBP) held its fourth STEM (science, technology, engineering and mathematics) Entrepreneurship Academy Sunday through Friday, July 8–13. Twenty-nine rising 10th and 11th graders from 11 high schools — Aliceville, Amelia Love Johnson, Lamar County, Holt, Berry, Pickens County, Greene County, Sumter Central, Hale County, Central (Tuscaloosa) and Greensboro — experienced a week of exploration, engagement and discovery within the STEM disciplines and the world of entrepreneurship. “Our STEM Academy is one that offers experiences in science, technology, engineering and math, but also expands the campers’ knowledge of business start-up and entrepreneurship skills,” said Dr. Holly Morgan, director of Community Education at CCBP. 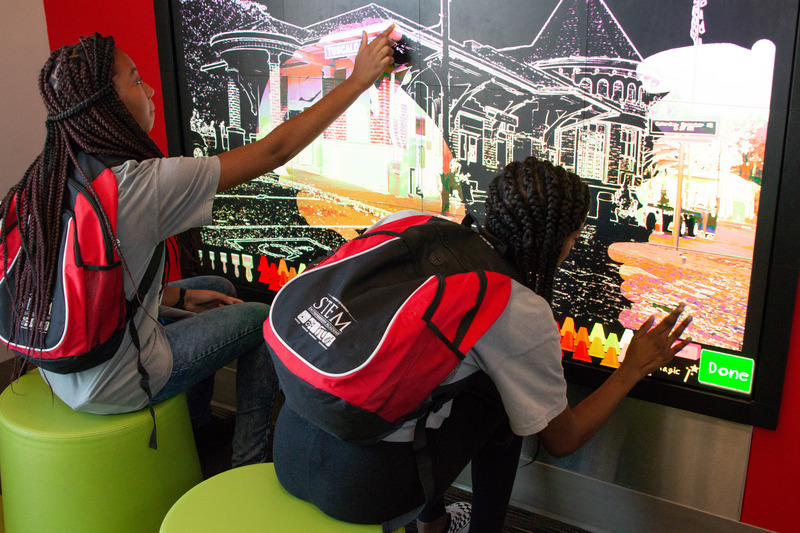 The camp’s goal is to offer a fun but challenging and innovative hands-on approach to help students understand STEM as fields of study. 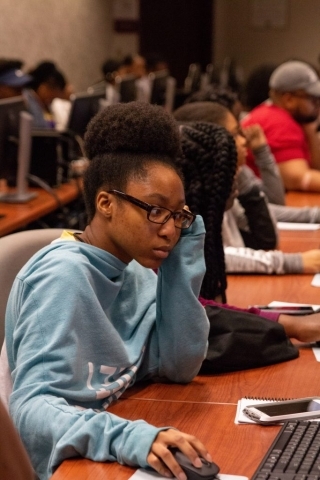 Students were also introduced to entrepreneurship concepts essential to the workplace and for business start-ups to connect STEM areas such as computer science and biology to the entrepreneurial model. 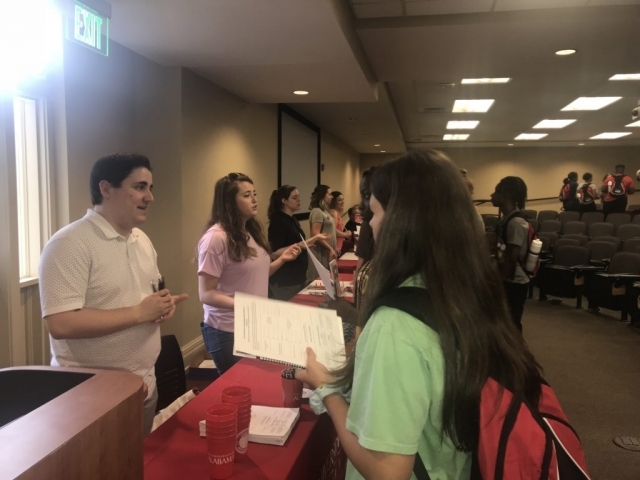 UA’s Career Center also administered a career inventory and conducted a strengths assessment as part of a simulated career fair involving representatives from several University colleges and departments. Morgan recruited an impressive teaching and administrative staff from the University and community for this year’s Academy, including UA graduate student Ashley Phan, computer engineering and mathematics; Mary Loyd Lowrey, UA Division of Student Life Career Center; Dr. Asma Hatoum-Aslan, biological sciences; Dr. Marcus Ashford, mechanical engineering; Dr. Rebecca Odom-Bartel, computer science; Dr. Jim Gleason, mathematics; and UA alumna Dr. Adriane Sheffield, curriculum and instruction, Coastal Carolina University. 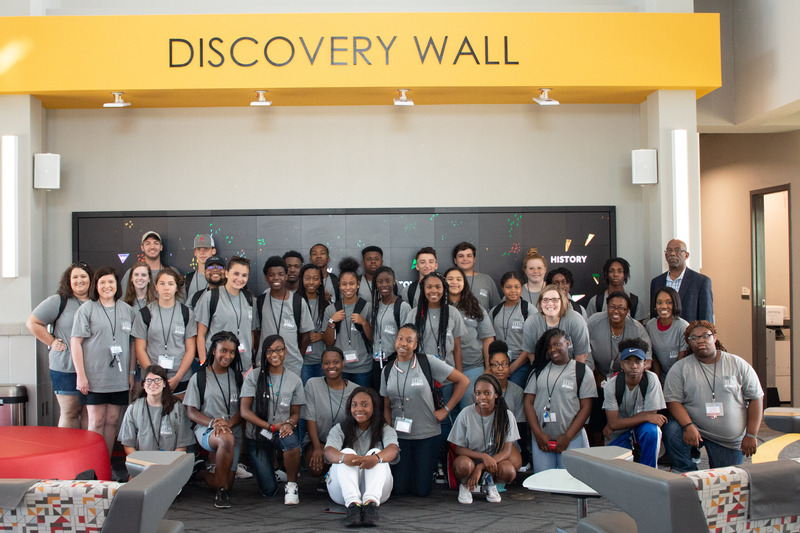 CCBP expanded its partnerships to additional campus and community entities for the 2018 STEM Academy. Partners included the Alabama Entrepreneurship Institute, the UA Career Center, High Five Studios — an indie video game design studio (independently made games produced by either one person or a small group of people) — and Tuscaloosa’s Gateway to Discovery, a City of Tuscaloosa innovation center. Alex Haisting of High Five Studios, spring 2018 UA graduate and winner of the 2018 Edward K. Aldag Jr. Business Plan Competition, spoke with students about his experiences as a young entrepreneur. 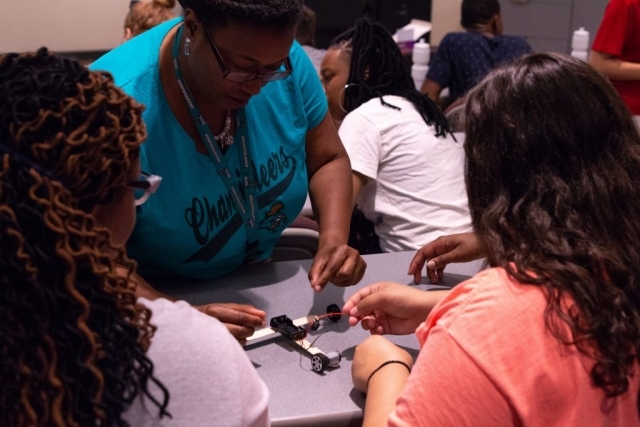 During the STEM Academy week, students were challenged to design a product or service that addresses a problem in their school or community with a hypothetical $2,000 seed grant. 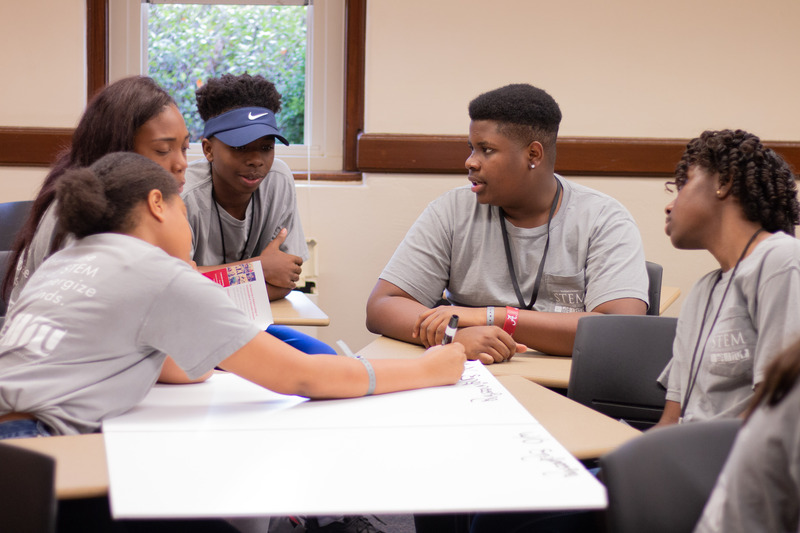 Under the guidance of mentors, students worked in groups and presented their proposals to other participants, teachers and parents during the closing program on July 13. Central High School 10th-grade student Keyonte Doughty said he wants to be a pediatrician, and the STEM Academy provided very useful information to him. He also liked the EcoCAR building activity, which was a collaboration with UA’s award-winning EcoCAR3 team. During this session, students learned about air pollution and its effects on the human respiratory system, as well as ways to minimize it. They received a basic overview of how hybrid cars work and how their use reduces air pollution. 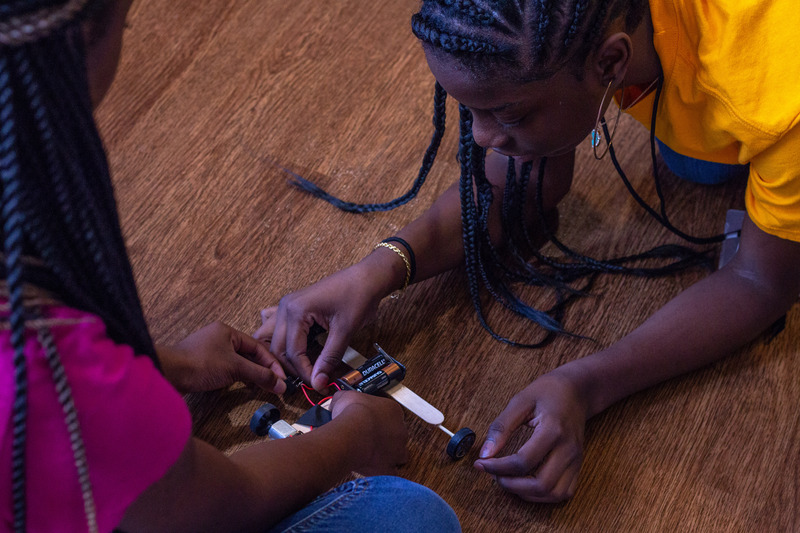 Before seeing the EcoCAR3 entry, a Chevy Camaro being transformed into a hybrid, students were split into teams of four or five and to work together to build their own model cars using popsicle sticks and straws, a battery and battery holder, wheels and a battery switch. Some of the designs ran on the first attempt, but most teams went back to the work table to determine what changes needed to be made to allow their creations to run. They concluded with a car race in the lobby of the AIME Building (Alabama Institute for Manufacturing Excellence), where team members cheered their cars across the finish line. 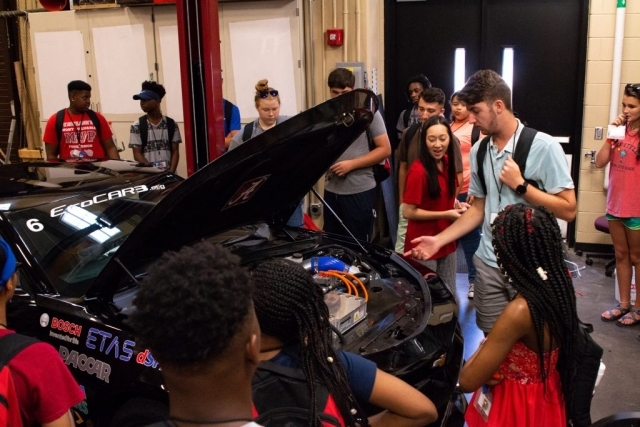 A short walk led students to the EcoCAR garage, where they had an opportunity to see the Camaro and to learn about the partnership formed by UA, General Motors and the U.S. Department of Energy. Phan shared that UA students from a variety of majors can become members of the team, reminding them that in addition to the mathematics and engineering involved, there is also a need for individuals with communication, marketing and a variety of other skills to complete the team. One of the University’s biology labs was another learning location for Academy participants. Following a lesson on antibiotic-resistant bacteria and instruction on the safety requirements and protocols for the lab from Dr. Hatoum-Aslan, students worked in teams of three to conduct their experiments using Andhra, a virus that was first identified by UA researchers in 2015 and that may help scientists learn about alternatives to conventional antibiotics. 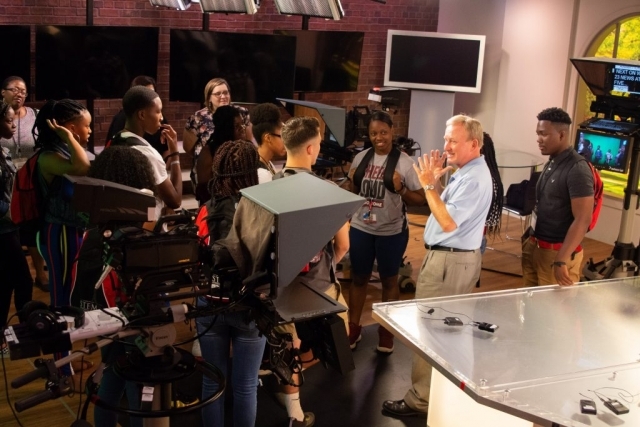 The lab was abuzz with excited conversation as students went on a bacteria-seeking mission, gathering swab samples from the floor, the restrooms, the bottoms of shoes, skin and even the event photographer’s camera. 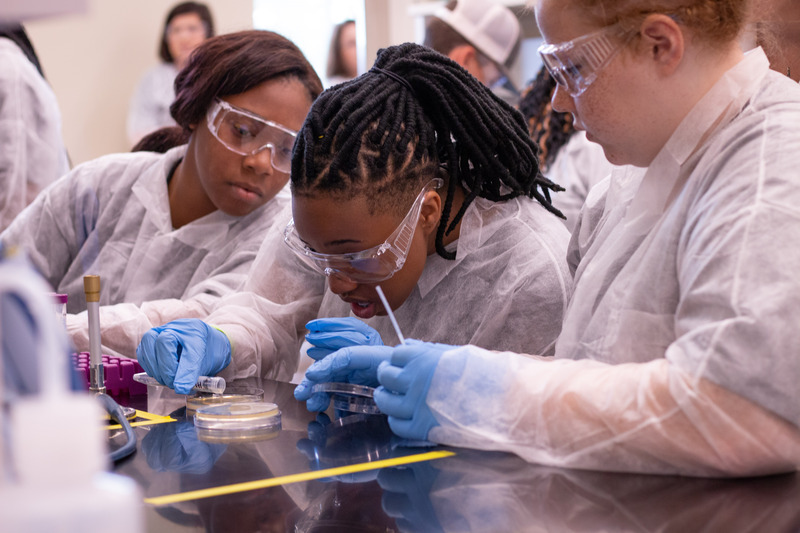 Prior to this experience, students from nine of the 11 participating schools had never had the opportunity to conduct a basic science experiment in a lab. One student shared that her high school has labs and Bunsen burners, but that the burners cannot be used because there is no gas hook-up. Another shared that their school was without a science teacher for the spring semester, so their science learning came from doing coursework online. 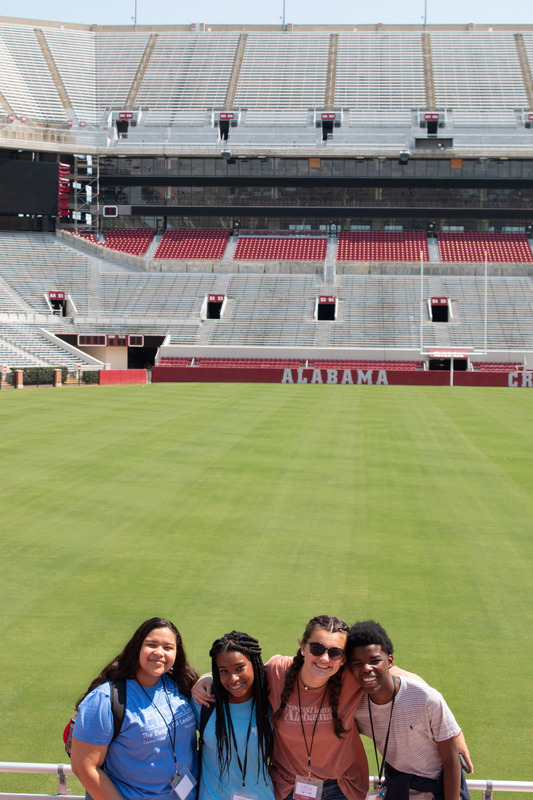 Jones, who has worked with these students since they were seventh graders, shared how much it meant to her to see them grow over time and take initiative during this on-campus experience, which she described as life-changing for them. She said that this was her school’s second year to participate in the Academy, and that it has provided an excellent way to get students away from home and out of their comfort zones to experience something new.